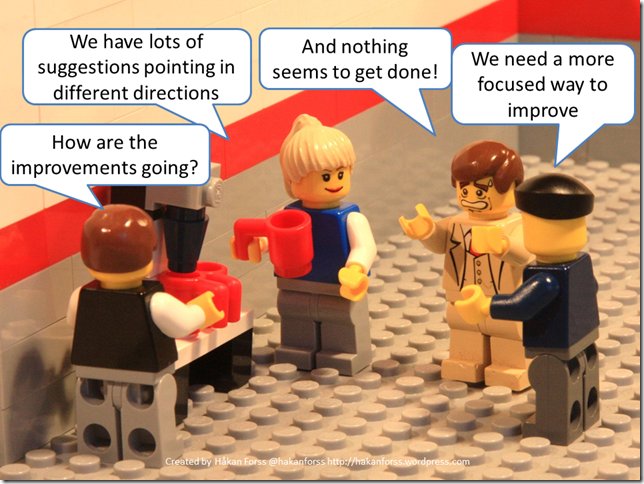 Kanban – What Is It And How Does It Work? You may be wondering what the Japanese word “Kanban” means, and more importantly how it can help you manage your work. A long time ago some very smart Japanese engineers from Toyota went to America to gather knowledge from their competitor; Ford. They learnt a lot from Ford, but Ironically the big “aha” moment came to them when they visited the local supermarket of all places! As they entered the supermarket to start shopping, they noticed signs had been strategically placed in specific locations to help them easily find what they were looking for in the most efficient, hassle-free manner. They also discovered that the owner of the supermarket only ordered the products that were low in stock, instead of bulk ordering products with no regard to his inventory. Simple, but ingenious! This is a classic pull system; the fact that deliveries were made solely based on the demand. The guys at Toyota, specifically Taiichi Ohno (the “godfather” of Kanban) were inspired to develop the visual pull system for managing work by moving through a “value stream” process called Kanban. We know you love your grocery shopping, so let’s pop back into the supermarket for a moment to help explain this one. “Pull” means that when a jar of a peanut butter is purchased it leaves an empty space on the shelf. Stock personnel will check quantities of peanut butter jars that have been purchased from the shelf and will replenish, or “pull” in the exact amount needed to fill the shelf again. Similarly, when a task in a project is done, a team member can pull in the next one, and as that one is finished the next one gets pulled and so on. That way, the project will be better managed, and only the correct quantity of work is being done at any one time. This means that your team should concentrate on working only on a small number of controlled tasks, and not starting new ones until the current ones are complete. This will make your workflow super productive, less wasteful and stress free. In fact, Kanban in Japanese stands for “visual signal” or “card.” This way, every worker can visualize the workflow and have a chance to notice the waste in it and suggest improvements to the process. Overall, Kanban acts as a system for visualizing work, reducing waste by limiting work in-progress and maximizing customer value. That’s why it became an effective tool for improving and maintaining a high level of production, in a multitude of various systems. By this point, you’re probably wondering what the heck your business has to do with Toyota or jars of peanut butter! Unless you’re driving their pick-up truck to the supermarket, then not that much, but understanding how Toyota managed their work can help you manage yours. As we progress into the knowledge work era, Kanban is quickly becoming the technique of choice for reducing waste and ultimately costs. It helps businesses to keep up with the ever-increasing demands of their customers. This is achieved by improving the flow of work, whether that may be a software or IT process or a general business process in a more gradual, transformative manner. The great thing about Kanban is that you can put it on top of your current processes and make it work for you. 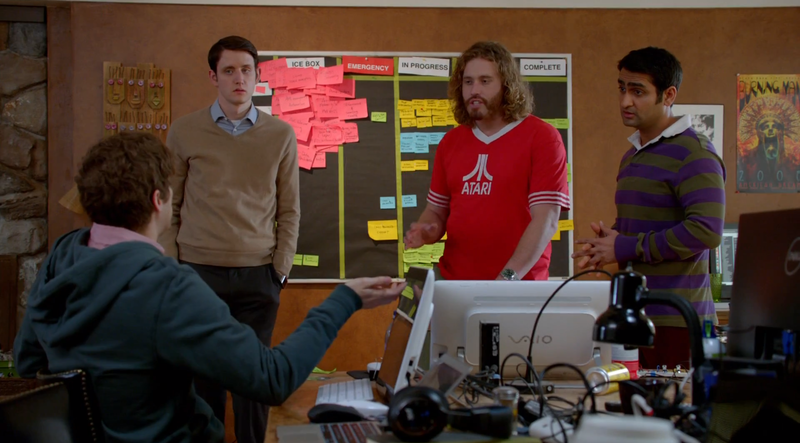 There’s no defined roles and ceremonies like in other frameworks (like Scrum). You can start using it right away. So, starting with your current process you need to make a conscious effort into thoroughly understanding what is wrong with it and how you can improve it. There’s a good chance you’ll get a sharp wake up call at this point! You will likely discover that until now, you thought you didn’t actually have any problems – which ironically is the biggest problem of all. However, now you have the chance to draw issues to the surface and work to find improvements. Again, the great thing is that Kanban doesn’t ask you to change your current process, instead it will help you evolve it into something that will make your team and customers happy. So if you are to change and improve the way your team/organization is doing things you will have to do that in a subtle and evolutionary pace. This means taking small but wise steps. Evolutionary change means that when it comes to improving your process, you will never feel that you have arrived at a final destination – a place where your team and your processes are set in stone. Kanban will help you measure your process’s capability, so that you can identify space for improvement. Then you will use that space for modeling and suggesting changes. The great thing about Kanban is that it makes sure you do this each step of the way, simply by responding to needs. In order to understand the needs you will want to understand how the work you get done serves it’s purpose in the eyes of the customer. So, your team or organization’s capability along with customer needs should be your main driver for change. Before any of this happens, you need to put people first. If your current way of doing work, or at least some elements of it are good enough to be preserved, then this simply indicates that change is not always prescribed to happen. You will continue seeing value in the existing processes, roles, responsibilities and job titles. While respecting how people in your team are currently doing their work, you should also respect the fear that they might feel from introducing change. There’s no need for drama. Nobody is going to get fired or kicked out if it becomes apparent that things need to change and improve. The great thing about Kanban is that it will make the need for improvement obvious enough to help your team to buy into it. Ultimately, the goal is to provide value to your customer. But how will you make sure that customer value is everyone’s key focus? This is not something that can be delegated. Making customers happy, asks for things to improve. In order to improve, things will likely need to be changed. This effort won’t see the light of a day unless everybody embraces the Kaizen (continuous improvement) mindset. Seeing improvements in current capability, learning from failed practices, being receptive and lucid each step of the way should be a joint effort. Now apologize if we bored you with the philosophy, but actually there’s a lot of common sense behind it. It’s good to put the theory in place before we get hands on. 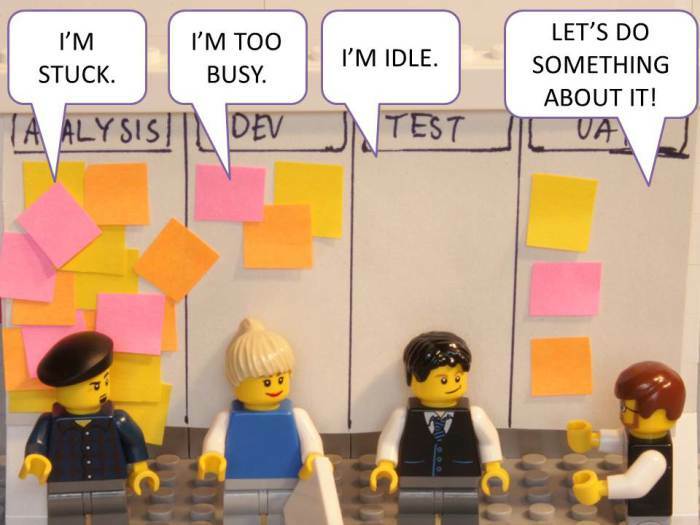 So, how do you actually use Kanban? What it means to start with what you do now is to understand how your company’s workflow looks at the moment. This includes the whole process from order request through to the final product or service. 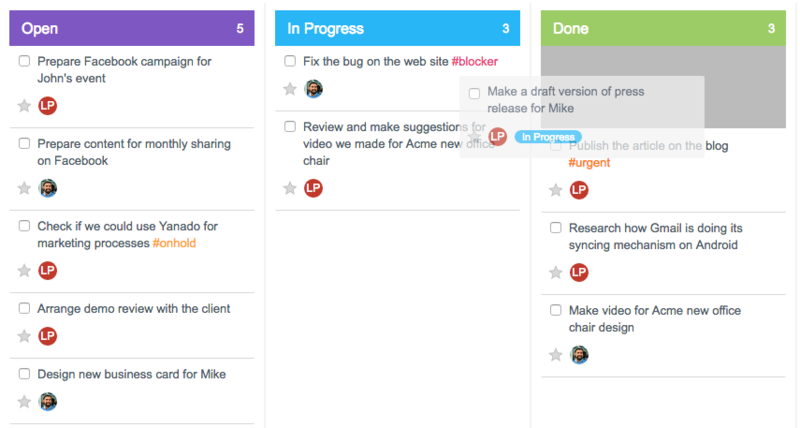 Kanban will help you do that by visualizing the workflow by creating a Kanban board. The great thing about visualization is that problems come to the surface – right where you can see them. Once the need for changing how things work becomes apparent you will better understand what to do in order to make improvements. A Kanban board serves to map out the steps in your process by using cards to represent the work that’s flowing through the system. A classic Kanban board consists of 3 columns which are populated with cards representing a task or a work item. Open – represents a list of items that need to be done next based on priority. Tasks on the top are the priority. In Progress – items that are being worked on right now. Done – list of completed items that are ready to go. Cards move from left to right (from ‘Open’ to ‘Done’), thus creating the flow. Different types of tasks may be given different colors so that everyone can easily identify the work to be done and its status. Cards/colors/signs could also be used to point to some crucial information, such as roadblocks, bottlenecks and tasks on hold. There are many different ways you could use Kanban boards (depending on each industry or business process). Feel free to make all the essential information available. Play with it. Make it work for you and hard for everyone else to ignore. Especially when issues arrive. Context is what is relevant. Kanban allows you to design processes based on the context. Using context for building a Kanban board could be a lot of fun (playing with colors, cards, signs and different gimmicks). That being said, on the other hand there is also the opportunity for people to abuse the system. For example, not keeping the board up to date meaning it doesn’t truly represent the current situation or to represent the status of a job dishonestly on the board just to look good. As if anyone would ever do that. In order to keep the flow of your work unimpaired and consistent, Kanban asks you to set the limit on the work in progress. This means you should focus on one thing at a time. This way, a new work item is “pulled” into the next step when there is available capacity within the WIP limit. Simply put, this limit will stop your team member from taking on any new tasks before he/she finishes with the ones they’re currently working on. And why? Well, because the more work your team tries to tackle, the more distracted they will get. This distraction results in unfinished work, long production cycles and the low quality of any finished work. There is no secret formula for doing that, but the basic questions to ask should be; How many people do you have in your team? How many items they are able to work on at any given time? Limits in Kanban are very important, because they drive people to act differently than they normally would – overloading jobs, multitasking and creating waste. Choose not to take WIP limits seriously, and you choose to make improvements less possible to achieve. Eventually, you hinder the balance you strive for. Let alone the predictable delivery, smoothness of the flow and all those happy faces. Don’t you just love a happy face?! So far, visualizing the workflow helped you understand what you are doing. It made you focus on pain points and instigated your team to improve certain areas. Now in order to foster your team’s responsibility for how the work is done, it is essential to tackle those areas of improvement by managing the flow. Given that you can’t manage what you can’t measure, the flow of the work items should be observed and measured. Now, how you do that? Well, primarily the flow shows you how the work is moving. The ideal flow is the one that is both fast and smooth. Fast means you are getting things done (delivering the value) quickly, smooth means you are not taking risk with delays or waiting costs. Eventually, everything you do is predictable. As work flows through the process some interruptions will inevitably crop up such as tests failing and rework needing done, or work sitting and waiting to be tested long after it’s complete, or design work that takes several cycles to get right. The goal of Kanban is to make positive change to optimize the flow of work through the system. Before you can create that change you have to know what to change – what problems to tackle. Cycle time (CT): The time an item spends on the board, from ‘Ready’ to ‘Done’. It is not a measure of effort, but elapsed time in days. Little’s Law: CT and TP are related by a simple formula known as Little’s Law, which states that TP = WIP/CT. From this it is clear that, for a given amount of WIP, throughput will increase if cycle time can be reduced. So, it takes an effort to look at how value is currently flowing through the system, analyzing problem areas in which value flow is stalled, then implementing changes and improvements. Then, you will repeat the process – going through the cycle again to see what effect your changes had. Because you need to know if the change you made had a positive or negative effect on the flow. You never get to arrive at a final destination, remember? There’s always room for improvement. Everything you’ve learnt about Kanban so far requires policies everyone in the team is encouraged to understand and agree on. You can’t expect to improve something if you don’t understand it in the first place. The same thing refers to how you approach it. Defining the process explicitly is what will make it work. Practically this means everyone is on the same page when it comes to how things work. Only then will it be possible to move to a more rational, empirical, objective discussion of issues. For example, if everyone on the team agrees to put a limit of 2 tasks in the work in progress then everyone should agree not to violate that. You must strive for emergent, explicit policies. Any time that a team encounters a new situation that calls for a new rule then you can add it to the list of policies you follow. Those could be the things which either prove to be repeatedly problematic (like deciding to use the red card on the board to signal that a road block has happened, such as a bug in the software or an urgent support request from the customer), or those that are especially important for the team (like deciding to do the testing right after the code is done, and not letting it wait). This should be a common effort of the whole team – showing they not just understand the whole thing, but they care about it as well. If you want your processes and policies to evolve and improve you will need to provide regular feedback loops that will help your team to understand the actual outcomes, in comparison with the expected ones. Use opportunities like daily stand up meetings, service delivery reviews, performance reviews. Once your Kanban system is in place, it serves as the foundation for continuous improvement. The team measure their effectiveness by tracking flow, quality, throughput, lead times and more. Experiments and analysis can change the system to improve the team’s effectiveness. Start small. If it helps, keep it. If it harms, learn why and change it. The Kanban method encourages small continuous, incremental and evolutionary changes that stick – it is a catalyst for process improvement, not a development process. Who wouldn’t agree, Kanban truly is ingenious! We hope you’ll give it a try – Yanado can help you with that. Next time we’ll show you how different industries and processes take the best from Kanban, so better leave your email address below or you will miss it!